After 18 months planning and fundraising the fantastic new 3G community pitch at Kilsby Lane was officially opened by Rugby MP Mark Pawsey on Friday. It was day of celebration, with the Norwegian international girls’ squad attending, as well as Rugby Town JFC teams, with the highlight being a game of walking football. Rugby Town JFC chairman Liam Coulter explained: “We have been progressing this project for the last 18 months and we are delighted that thousands of people will be using the facility, which is a boost for sport in the town. “I have sat in meetings sometimes five times a week to get this right and funded. There have been a few blips along the way but we got there. Two people stand out in the delivery of this project, and I would like to personally thank them for their hours upon hours of work. They are Brian Crinigan and Jason Morris. “The detail and planning as well as co-ordinating the funding applications was outstanding and how it all suddenly fitted into place. I can get a good night’s sleep now! Funding has come from: Sport England £371k, WREN £50k, Rugby Benevolent Fund £8k, Garfield 5k, Bernard Sunley 2k, Heart of England 2k, Rugby Borough Council 1k and then the club’s own fundraising efforts, including the Rugby Half Marathon and Spring Fair Bottle Stall. The goals were also purchased with these grants, with Nationwide Windows providing funding for an additional set of 9 v 9 goals. Coulter also praised their magnificent main sponsors Nationwide Windows and McDonalds, who have sponsored the two banners at both ends of the pitch. The pitch was constructed by SIS (UK) World leaders in artificial pitches and a company on the Sport England and Football Foundation framework. Jason Morris continued: “There have been several changes to the original specification and SIS and in particular Cameron Thompson the project manager has provided the club with a world class FIFA 2 Star surface, which can be used for Conference games. The official opening day was attended by local dignitaries including Rugby’s Mayor Cllr Sally Bragg, the Leader of Rugby Borough Council Michael Stokes and councillors from the local area. Regional and National FA officials were also present as well as Allison Orr (WCAVA) and members of the local media. Mark Pawsey, Rugby MP, in his opening speech praised the club for being a real community asset and said how easy it was for him to stand up in Parliament and shout about all the great things that happen in Rugby and one of those things is unquestionably Rugby Town Juniors Football Club. Mr Pawsey highlighted how the club is able to bring together people of all ages from the local community through a shared passion for sport which is helping to keep young people in particular fit and healthy. “At a time when the government agenda is all about getting youngsters to be more active, to be fitter and stronger and enjoy the benefits of team sport, the fact you have so many people down here throughout the week and at weekends is absolutely brilliant. You have a wonderful surface here and it’s a brilliant asset to the town,” he said. Olly Hitchcock Facilities Manager at the County FA added: “We would like to congratulate Rugby Town Juniors on the opening of their new 3G pitch. The club currently runs 60 teams from U7 to U18, links in to the Strachan Football Foundation Education programme and runs a reception and year 1 Tangos programme, with over 70 boys currently training with that group. The club also run Girls and Ladies’ teams and have a Walking Football team along with a new disability section, which started off on Tuesday and is supported and funded by the County FA. The club also runs teams in the Midland Junior Premier League on a Saturday in partnership with Future Pro and are looking to extend it with U11 and U12 teams next season. 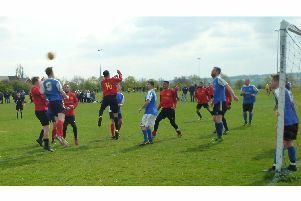 Leisure Leagues, a leading national six-a-side company, run a popular Sunday night league with 16 adult teams currently taking part. The pitch adds to the current facilities of two smaller astro turf pitches and 18 grass pitches.